HMS Iron Duke (F234) a Type 23 frigate of the 'Duke' class built by Yarrow Shipbuilders and launched on 2 March 1991 by Lady Jane King. She is the 3rd ship to bear the name in the Royal Navy. Her operational career has included deployment to Sierra Leone during the 2000 civil war. She has been involved in drug interceptions in Caribbean waters in 2003 and 2009. Prince William served onboard for 5 weeks as a sub-lieutenant in mid 2008. During 2011 she took part in shore bombardments off Libya. She has a displacement of 4.900 tons, a top speed of 28 knots and a length of 436 ft 4 in. HMS Iron Duke (F234) a Type 23 frigate of the 'Duke' class built by Yarrow Shipbuilders and launched on 2 March 1991 by Lady Jane King. She is the 3rd ship to bear the name in the Royal Navy. Her operational career has included deployment to Sierra Leone during the 2000 civil war. She has been involved in drug interceptions in Caribbean waters in 2003 and 2009. Prince William served onboard for 5 weeks as a sub-lieutenant in mid 2008. During 2011 Iron Duke took part in shore bombardments off Libya. She has a displacement of 4.900 tons, a top speed of 28 knots and a length of 436 ft 4 in. She is shown arriving at her St Helier, Jersey. 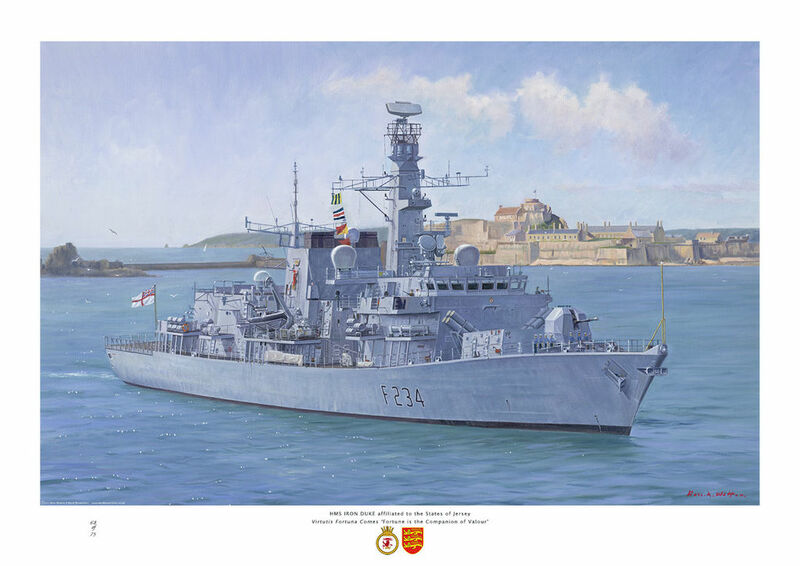 The painting was commissioned by the HMS Iron Duke, and is displayed on board.